Waiting on Wednesday is a weekly meme hosted by Jill over at Breaking the Spine, to showcase much anticipated upcoming releases! From Goodreads: "In the magical underworld of Victorian London, Tessa Gray has at last found safety with the Shadowhunters. But that safety proves fleeting when rogue forces in the Clave plot to see her protector, Charlotte, replaced as head of the Institute. If Charlotte loses her position, Tessa will be out on the street—and easy prey for the mysterious Magister, who wants to use Tessa’s powers for his own dark ends. I can't wait for the release of this one! I want to re-read Clockwork Angel before it comes out. So I can re-familiarise myself with the world of the Shadowhunters! I enjoyed the first a lot. I'll probably have to re-read the first though as well because I forget what happens. I love Cassandra Clare's books though. A lot of people are excited for this. I still have to read the first in the series. I am really excited about this one! I think I almost love this series more than The Mortal Instruments series. Great pick! Welcome to WoW...so glad to have you! I haven't read this series, but it looks really interesting. Thanks for stopping by my blog! Woohoo! This was my pick just a few weeks ago. 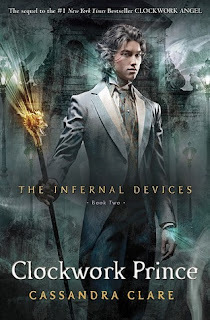 I'm really looking forward to continuing the Infernal Devices series! Great pick and welcome to WoW! You can check out my WoW over at Fuzzy.Coffee.Books! Holy hotness batman!!! I am dying to read this book!!! December canNOT come soon enough!!! Thanks for checking out our WOW this week!!! My friend and I were talking about this today and how we can't wait until it comes out!! I love all of Cassandra Clare's books :] Awesome pick this week! Oh! And thanks for stopping by my blog! Oh good choice! I haven't read Clockwork Angel yet (I plan to this month) but I read her Mortal Instrument series and it was great.